Bank of America Savings Account - Open a Rewards Savings Account Online Whether you're new to saving or an experienced saver, enjoy a wide-range of benefits with one simple savings account from Bank of America. Open a Rewards Savings account online and receive benefits on interest rates, FDIC insurance, overdraft protection, transfers and more. Open now Rewards Savings Account Not ready to open online? Whether you’re new to saving or an experienced saver, you can enjoy a wide-range of benefits with one simple savings account layer. Simply put, every dollar you add to your Rewards Savings account combined with our rewards programs gets you one step closer to your savings goal. A savings account is a deposit account that generally earns higher interest than an interest-bearing checking account. Savings accounts limit the number of certain types of transfers or withdrawals you can make from the account each monthly statement cycle. As your account balance grows, your interest rate has the potential to increase too. Get cash back for the things you buy every day. Earn up to 15% cash back at stores, restaurants and more with BankAmeriDeals and have it deposited directly into your Rewards Savings account. Preferred Rewards clients can enjoy even more benefits based on their relationship tier. Make everyday purchases with your Bank of America debit card and we'll round up your purchase to the nearest dollar amount. We'll transfer the difference from your checking account to your Rewards Savings account. Planning for future college expenses? Get convenient account access, now with fingerprint sign-in and Touch ID®. Use our free mobile app to deposit checks, check balances, pay bills, transfer money and locate ATMs and financial centers on the go. Plus, with our customizable mobile app alerts you can stay informed of just about everything that happens with your savings account. Access to our network of financial centers, ATMs, and Online, Mobile and Text Banking. Set up automatic transfers to help build your savings. Simply choose the amount and frequency you want to transfer money. Plus make changes anytime. Link your savings account to your checking account for Overdraft protection. 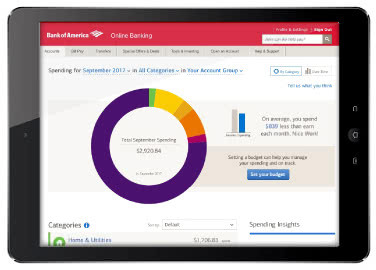 Stay on top of your finances with this Online and Mobile Banking tool. Find out how to make the most of your financial life for you and your family. See how long it takes to save for the things you want in life. Looking for more information about savings accounts? Looking for a more long-term savings option? Investigate other types of accounts. MasterCard is a registered trademark of MasterCard International Incorporated, and is used pursuant to license. Visa is a registered trademark of Visa International Service Association, and is used pursuant to license from Visa U.S.A. Inc.. Touch ID is a registered trademark of Apple Inc., registered in the U.S. and other countries. Bank of America Advantage SafeBalance Banking, Bank of America Advantage Plus Banking and Bank of America Advantage Relationship Banking are trademarks of Bank of America Corporation. Get More Rewards With Your Everyday Banking, Merrill Edge, Merrill Lynch, Keep The Change, Bank of America and the Bank of America logo are registered trademarks of Bank of America Corporation.